He looks scared. And he should be. Tina Taps runs a tight ship. And rightfully so. As head of the U.S. Open ballperson operations at Flushing Meadows, Taps employs nearly 300 people each year to make sure that the matches of the Open not only operate well, they do so almost flawlessly. And her end result? Usually perfection. Sure, there’s a mis-thrown ball here or fidget there, but these are the best of the best. And when you’ve had the chance to experience the vigorous tryouts that Taps puts on, you’re going to do the job just fine. 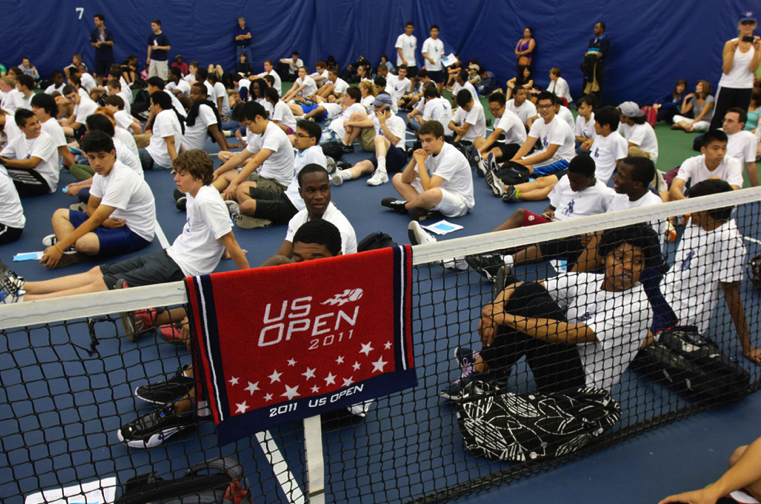 A couple of weeks ago I headed out to the National Tennis Center in Queens to survey the scene of tryout day. Last year I had done a mock (or was it real?!) tryout myself, getting put through the ordeals of running and catching and sprinting my way through Court 7. With ball people, it’s really all about timing. If your timing is off coming to grab a netted ball, you could delay a match. And if you’re a little early, well, just ask this French kid what happens. But this year I was simply observing, something I was happy to do. I also was able to corral a few veterans of the U.S. Open ballperson world to talk with me for a few minutes about a few things you should absolutely do, and a few things you should absolutely never do while on the court, providing TSF with 10 do’s (and don’ts) from the uso ball person tryouts. 4. DON’T: Take the foil off the unopened water bottle you’re handing to Venus or Serena. “They’re Germaphobes,” another veteran ball person told TSF. Otherwise, Serena might do this. 5. DO: Drink water. “Any time the players get water, we can get water,” Hollins assures us. 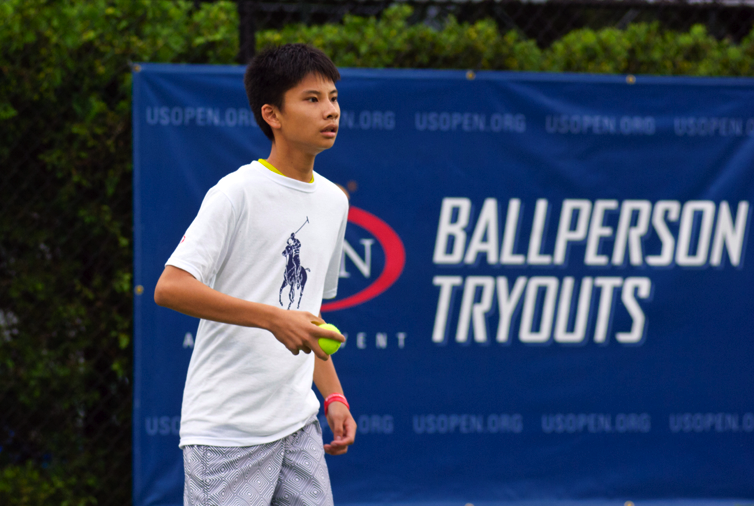 Good, because we don’t want any USO ball people ending up like this poor kid. The ball people are on two-hour shifts on court, with a crew of six that is led by a crew chief — usually a veteran — who makes sure everyone is feeling all right, has consumed water and doesn’t have to be removed from the court. The ball person “perch,” as it’s known is just under the bleachers on Grandstand. “In the perch you can call out and have someone come down and replace anyone who is tired or hungry. The crew chief makes that call,” Hollins explains. 6. DON’T: Hand Andy Murray his towel any other way than on his racket. Venus and Serena aren’t the only player with tics on the court. “Everyone has their little habits,” Hollins says. “Some people need their towels handed to them in a certain way. Andy Murray? he likes his towel on his racket. Mardy Fish likes his handed to him in a ball.” Obviously this ball kid didn’t get the Murray memo. Tough competition: Taps told TSF that around 500 people tried out for some 75ish spots this year. Maybe it’s the economy? 7. DO: Mess up. It’s human! “When they’re first coming in, people sometimes don’t have the best throwing arms. Or they throw or run between first and second serves. They’re a little nervous and emotions run high so we just remind them to relax and stay calm and positive,” Hollins explains. “When a ball person messes up they think they’re on some list and then they try to do everything perfectly and they’re too tight.” But if you actually do something wrong, Novak Djokovic will punish you! 10. DON’T: Forget to have fun. After 15 years at the open, Fowler is keen on this one. “I laugh all the time, even when I’m not supposed to. I find everything around me funny. There are some ball people who take it super seriously. It’s three weeks out of the year where you get to have fun!” And why don’t you fall a little, too? Because second to women’s figure skating people love watching ball people fall. And fall again. This entry was posted on July 7, 2011 at 10:14 am and is filed under tennis, U.S. Open. You can follow any responses to this entry through the RSS 2.0 feed. You can leave a response, or trackback from your own site.